Between 2007–2010, in support of their sterling efforts in the real world, in The Pomeroy’s Press newsletter we created a better connection between Pomeroy’s and their patrons by using images wisely in print and on the pub website. Getting personal with patrons allowed them to connect with the Pomeroy’s team and the congenial culture Steve, Victoria and their family cultivated. Backing up the Pomeroy’s family hospitality by presenting the business in an equally personable way in print media and on the web meant people were supported in emotionally investing in a relationship with the pub and quickly grew to feel it was a home away from home. 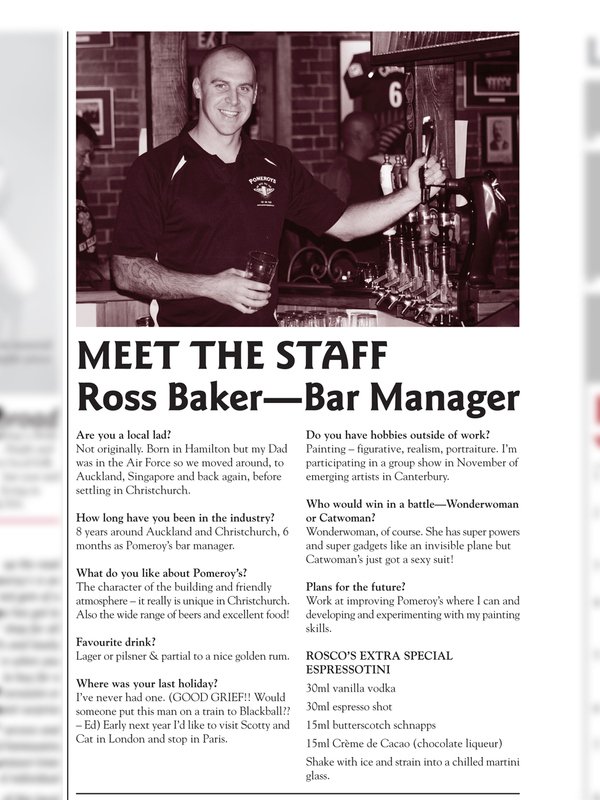 Scroll through the gallery below to see a historical record of Pomeroy’s “Meet the Staff” articles and images 2007–10. Notice how delightfully vivid and entertaining the writing and imagery combination is, it makes you feel part of the ‘Pomeroy family’ experience meeting these wonderful people ‘in print’. Excellent graphic design for this popular Christchurch social venue conveys care, craftsmanship, professionalism, it is beautiful to see and fun to do.